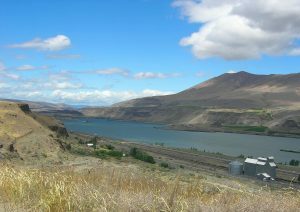 The north end of Sherman County borders the Columbia River, home of the Biggs Service District in Rufus, Oregon. The Biggs Service District was created in 1991. The purpose of the District is to furnish essential water services to the Biggs area of Oregon. When necessary, Sherman County Court "motions to enter into" Biggs Service District. Commissioners then perform as the Biggs Service District Board of Directors to address business of the District. The County judge serves as chair of the board, and the other two commissioners serve as members of the decision-making body for the District. The Board of Directors is separate from the County Court. The board is responsible for wastewater plant operations and some public infrastructure in the unincorporated town of Biggs, otherwise known as Biggs Junction. In 1994, the Biggs Service District Board proposed the construction of an activated sludge secondary treatment facility and gravity collection system (see the District's Wastewater Discharge Permit Evaluation for full details). The treatment system utilizes "extended aeration treatment technology" with ultra-violet disinfection; it has a "build-out design average, dry weather flow" of 79,000 (0.079 million) gallons per day. This secondary wastewater treatment facility went into operation in 1998.
service lines to each building. The water project will considerably improve fire flow, up to 2,000 gallons per minute, and is designed to provide reliable water service even when the power is out. The project also brings a higher likelihood of new development and existing business expansion in Biggs. The system will be centrally chlorinated and controlled, which will provide improved health protection. Progress on the water project will continue to be made available in Sherman County Court minutes. If you have questions, please contact Sherman County Court.